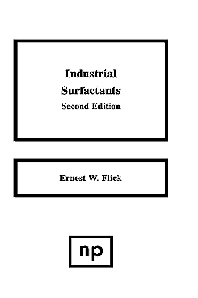 The second edition of this useful book describes almost 2900 surfactants which are currently available for industrial use. The book will be of value to technical and managerial personnel involved in the specification and use of these products. The information has been developed directly from information received from 46 surfactant suppliers. Industrial surfactants find uses in almost every industry, from asphalt manufacturing to carpet fibers, from pulp and paper production to leather processing. Examples of the types of chemicals used as surfactants are fatty alcohol sulfates, alkanolamides, alkoxylates, sulfosuccinates, amines, quaternaries, phosphate esters, acid esters, block copolymers, betaines, imidazolines, alkyl sulfonates, etc. Asphalt manufacturing to carpet fibers, from pulp and paper production to leather processing.